MIA2018 shows itself: after attendance record of the last year, the meeting among film and television industry leaders comes back. MIA | International Audiovisual Market starts again from October 17th to 21st 2018. After last year great results, its original and cross format proves itself, unique one within the national and international panorama, placing itself among the golden opportunities of the audiovisual industry, where it is possible to find new business opportunities of co-production and product export. With almost 1800 operators from 50 Countries, a month before the start, it already presents a qualified and extended parterre of international attendance and an always wider content offer in absolute preview, by anticipating market trends and global products of the next years. With Palazzo Barberini (Rome) as the frame, on September 24th 2018, MIA presented its fourth edition (October 17th-21st 2018) which remains in the center of Rome this year too, around “distretto Barberini”, from Palazzo Barberini – with new and wider spaces – to Hotel Bernini Bristol, Cinema Barberini e and Cinema Quattro Fontane. The Director of MIA Lucia Milazzotto opened the presentation press conference, underlining that “MIA is reaching an increasing number of contents and international interlocutors, by which all the principal investors and new platforms (from Netflix to Amazon) are represented”. Speaking of which, according to ANICA President Francesco Rutelli, MIA is an important initiative, a vehicle to make connections possible within the audiovisual sector”. An event “supported by several institutions – as APT President Giancarlo Leone reminded – which counts almost 1800 operators, 130 projections and 60 projects”. 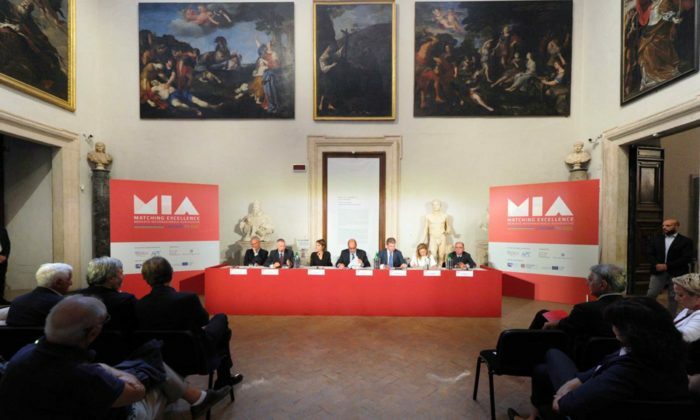 It was also present in the press conference the MISE Legal Counsel on Communication and Digital Innovation, Marco Bellezza, who reiterates how MISE believes in the audiovisual, highlighting that “MIA is a business event which values the operators and the production chain and it is a market of numerous realities of excellence”. According to MIBAC General Director for Cinema Nicola Borrelli, MIA represents “a fundamental link in a strategy which revealed in advance the union of cinema and audiovisual”. The ICE Officer at the Coordination office for the Promotion of Made in Italy, Maria Ines Aronadioreaffirmed that the aim is to “make Italy an international film set to extend made in Italy” by also claiming how ANICA and APT were able to find “the formula for a breakthrough abroad”. In the closing of the conference the Lazio Region President Nicola Zingaretti intervened by saying that “MIA is an intelligent way to support a cultural and economic growth in Italy”. He also reminded some important data: “in 4 years 48 films and fictions have been realised, which have led to a 30% increase in the italian audiovisual export”. MIA| International Audiovisual Market is designed, realised and produced by an ANICA (National Association of Film and Audiovisual Industry) ‘Raggruppamento Temporaneo di Impresa’ through its subsidiary society ANICA SERVIZI S.r.l. and APT (Television Producers Association), financed by Ministry of Economic Development and ICE – Italian Trade Agency, with the support of Ministry of Cultural Heritage and Activities, Lazio Region, MEDIA Program. Among the partners there are, Lazio Innova, Roma Lazio Film Commission, Fondazione Cinema per Roma, Apulia Film Commission, British Film Institute (BFI), British Council and English Embassy in Rome , with the partnership of the European Producer Club, Europa Distribution, UNIFRANCE, France Embassy and Alice nella città.